We all treat sparklers with a certain amount of disdain, as they are considered to be the ‘least pyro-esque’ item in most firework shop ranges. Indeed, they are frequently given free or form part of the ‘afterthought’ process … you know the one, the order arrives on the trolley and the customer will then check out the purchases on the pile before the inevitable ‘Do you do sparklers?’ comes. But in reality, they are a beautiful addition to any occasion whether fireworks are there or not. Over the last couple of years, Sparklers have been introduced into Wedding celebrations but one of our favorite uses is for ‘Sparkler Art’. Pop the camera on the tripod and pick your spot in front of the camera (it helps to establish your position whilst there is enough daylight. Dumbing down, especially for techo-phobes like ‘moi’, the exposure is set to 25-30 seconds and this is your ‘drawing time’ where everything done in front of the camera will form the final image. You can avoid a ‘tail’ or ‘trail’ on your image if you just continue to overdraw until the click if the shutter. One other tip, if you are writing your name, you need to do this backwards. 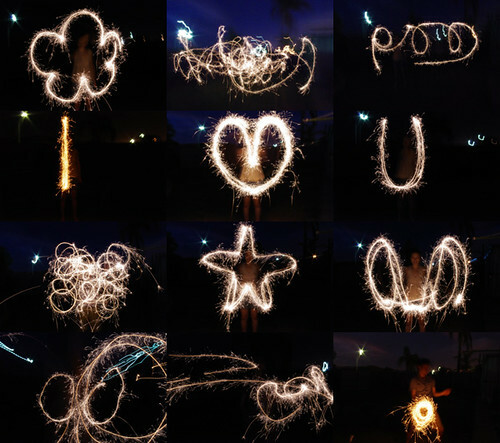 We absolutely love sparkler art and have tried a couple of times with our point and shoot camera’s without much success, but having bought my hubby a Fuji Finepix S9500 for Christmas, we are only a few steps away from capturing some brilliant shots so we will keep you updated as this might be a project for the weekend. Give it a try and we will feature the images on our website/FB page.